As you probably know by now, I think it is unfortunate when stylistic, technical, or aesthetic trends in the arts are only considered in some art history textbooks in comparison to Western (European and American) art. What is more unfortunate is when Western art is used as the "standard" by which the same art forms from other parts of the world are judged. When the cast metal sculptures of the Benin Kingdom of Nigeria first came to light in Europe after the British sacked the city of Benin in 1897, Europeans could not believe the sophistication and realism of the works, preferring to attribute the lost-wax casting technique as learned either from the Portuguese or the ancient Egyptians. Art historians now believe that is definitely not the case. The lost-wax casting process is one in which a plaster or baked clay mold is made over a clay model. Once the mold is removed the interior surface is coated with wax. The wax castings are removed and a heat-resistant mixture (investment) is poured on both sides creating an inner and outer mold. The mold is baked in a kiln and the wax runs out, and molten metal is added to the mold, filling in the space where the wax was, essentially the "skin" of the sculpture (see The Visual Experience 3rd edition page 260 for a detailed explanation of the technique). This technique has been around since at least the fourth millennium BCE, and certainly by the first or second millennium BCE in sub-Saharan Africa. The process and style of metal sculpture of the Benin Kingdom probably evolved simultaneously with those of the neighboring Yoruba and Ife cultures. The Benin Kingdom is an ancient culture that gained prominence in the 15th century CE under the king (oba) Ewuare who established the empire's political organization and consolidated its territory by conquering Yoruba lands to the east. The political structure was like a fiefdom, with chiefs who ruled villages answerable to the oba. Despite the arrival of Portuguese traders in the late 15th century, the Benin maintained independence until the 19th century. When the British brought the sculptural treasures of Benin City to Europe it initiated the large-scale importation of African art to Europe. The objects were originally called Benin "bronzes" although most of the works, like this one, were of brass. This beautiful little work shows the typical seen of loyalty and homage to the king by lesser nobility. It is a high-relief sculpture in which the lack of background or surrounding decoration heightens the ceremonial aspect of the scene. 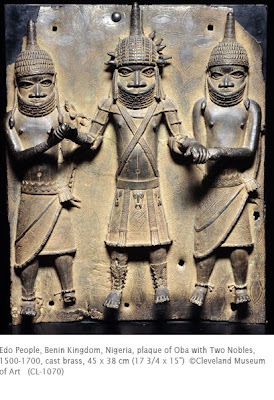 Such plaques were meant to decorate the columns and walls of the oba's palace in Benin City. They commemorated great moments in an oba's reign, and also were meant to represent the oba's continuing presence after his death. Other subjects in Benin metal sculpture were commemorative heads of kings and their relatives, court scenes, animals, and hunting scenes. The figural realism may have come down to Benin artists from the Nok Empire which flourished in Nigeria between 500 BCE and the 2nd century CE. The Nok were noted for their tin mining and iron smelting, both sophisticated industries for this time period. thanks for speaking to the "western standard", art has been understood sadly as an empirical process. mold maker Great post! you have some brilliant contents!